These animals have greatly influenced our breeding program, in addition to leaving an impression on our hearts. A brief look back at some of our great bucks and does, beginning with our more recently owned animals. Pictured at 5 months old. This buck is flashy and correct. I've never seen markings like his left side half belt. He was an easy choice to keep, as his dam, Medesima, is a superb homebred doe that has flourished and achieved my "wish list" of doe performance. Mahogany's sire, KJ, was only with us for one breeding season, and impressed us with his attitude and general appearance. Mahogany obtained his first GCH win as a 7 week-old kid over adult bucks! He threw 75% doe kids in 2016, and we are looking forward to seeing their udders in 2017. His daughters Tiva, Chandelier, and Maven have all obtained dry legs in 2016. I am very pleased with his full sister, Magdalene, as well. Photos: 1st row: Mahogany's parents: *B Mamm-Key Zephyr's King Julien (age 3) and SGCH Dawnwind Magnifique Medesima (age 6). 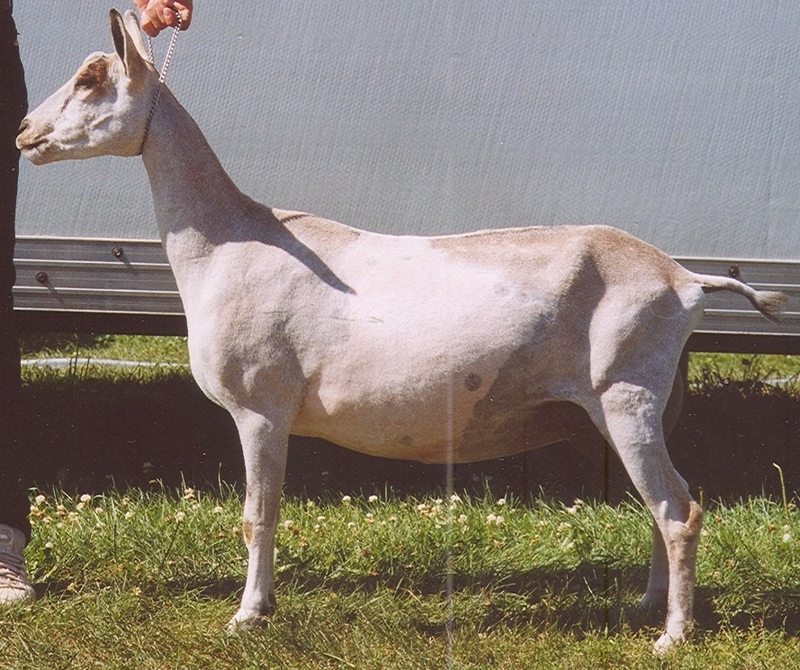 2nd row: Mahogany at 10 days (namesake Mahogany 1/2 belt), rear (5 months), and Medesima rear at age 7 with 8 hours of milk. Marvelle as a three year-old. Marvelle is powerful and tall, with a long bone pattern and a super rump. She is maturing smoothly, and has greatly improved over her mother's milk capacity (barn records in 2015, and official records in 2016 and 2017 showed over 16#/day). She won the 2015 WY Fuzzy Show's milking competition, and obtained her milking star. I look forward to more offspring like this from Bon Idee. Marvelle is incredibly powerful, shown from her muzzle to her chest to her rump. She placed 7th in the 4 Year-Old milking class at the 2017 ADGA National Show. We are retaining a daughter from 2017, by Mahogany: Melvyna. 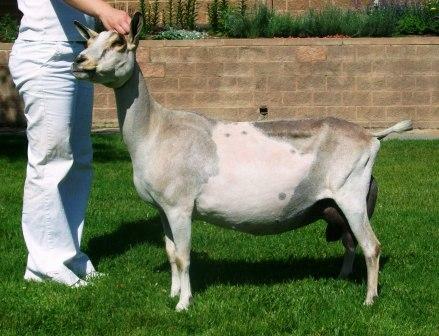 Breeding Plans: We are hoping for incredible toplines and foreudders by crossing her on *B L & S Alpines Tigres Trumpcard. A single February 2018 doe kid is retained. 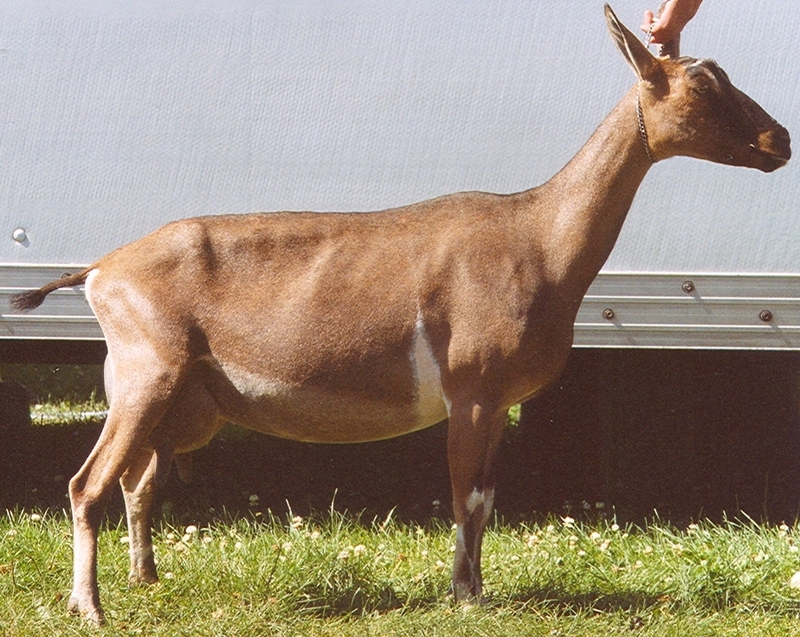 Above: Marvelle at age 3 years, 2 years, and as a milking yearling. Javotte at 2 years, first freshener. Javotte is an outcross, hoping that my M line and the Chateau Briant J line would combine. She is incredibly deep and surprisingly wide, though she is one of my smaller does. She was born several pounds lighter than her twin brother and was sold as a kid, and returned to us as a dry yearling after we lost her full sister, Jinglebob. I anticipate that she will continue to improve over time, which was confirmed by her high appraisal of 89 as a 2 year-old first freshener! In 2017, her udder continues to shine, winning BUIS at the WY Fuzzy Show. Her daughter by *B Dawnwind KJ Mahogany, Jetski, remains in the herd. 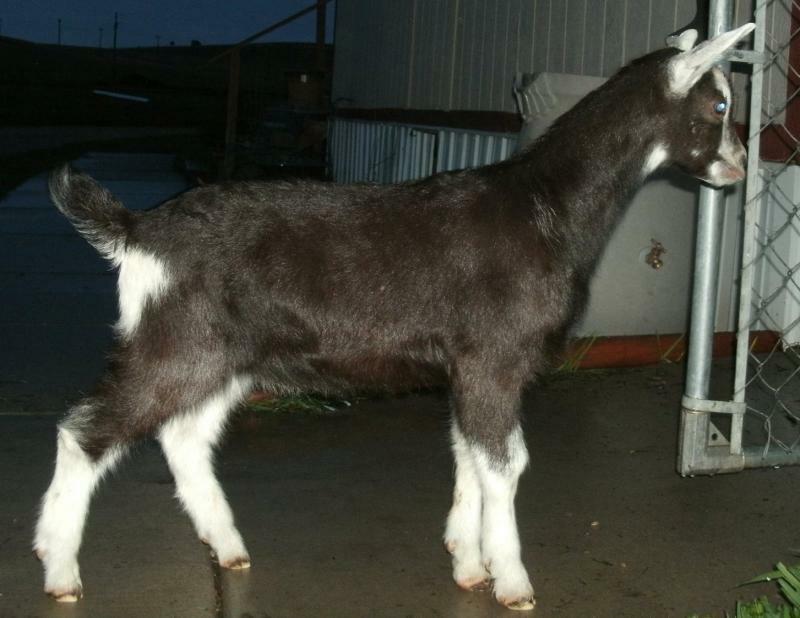 Breeding Plans: March 2018 kids by *B Dawnwind Lincoln Bonhomie (polled). ﻿At right: Javotte's rear udder at 2 years, 1st freshening. Far right, Javotte at 7 months. Lower line: Javotte's parents: SG Chateau Briant's Jacquard 11*M (age 3) and SG Dawnwind Mega Magnifico (age 4). Leprechaun was a bit of a late bloomer, and now has the length and height to match the other 2015 does. She is almost identical in coloring to her mother, with an improvement in hind leg set. Under Daniel Considine, she won a reserve as a milking yearling, and his comment was that she would have had best udder, but for the challenger (Medesima)! She won best udder of breed under Paula Reisdorff and Halie Weber as a 2 year old in 2017. Leprechaun placed 18th in the 2 year-old class at the 2017 ADGA National Show. At right: Leprechaun's milking yearling rear udder and Leprechaun at 9 months. Below: Leprechaun's parents: Dawnwind Magnificently Clever (yearling) and Iron-Rod SHM Show Some Leg (2 years). I am very impressed with Bonhomie. His sire, Lincoln had a beautiful kid crop for 2017. Bonhomie has increased in substance and length of bone over his dam, Blythe. A favorite for her wonderful personality and ease of milking, Blythe is also a top milker in our herd, has garnered awards in the show ring, and is maturing beautifully. We used Homie heavily in 2017. At right: Dam Blythe's 2 year-old rear udder and grand-dam Legs' rear udder at 2 years. Below: Bonhomie's parents: SG Dawnwind Clever Blythe 6*M (2 years) and Dawnwind Singed Lincoln (1 month). She is very much like her dam in coloring and style. She is so very flat across the topline and rump. She shows tremendous openness in the euscutcheon, and her teats are shorter like her mother's. She is showing a lot of will to milk, and her dairyness is shown in her pliable skin and wonderfully soft udder texture. Her daughter, Swan, was the 14th Intermediate Kid at ADGA Nationals in 2017. Below: Sairtia's parents: Iron-Rod Strength Singed (9 months) and Iron-Rod STB St. Claire (3 years). We bought Claire sight-unseen because her dam, Stencil, was so memorable to us during a visit to Leslie Sidwell and her goats in Virginia. St. Claire is showing many similarities to her dam, and is extremely tall, smooth, completely tight in her point of elbow, deep, and has very smooth udder attachments. Though elegant, St. Claire herself can be quite nervous, so showing her is unpredictable. With her anxiety, she was dried off early for 2017. Her paternal 1/2 sister was the phenomenal CH Iron-Rod STB Shelby (3-02 92 EEEE), who was named the 2014 Alpine National Champion. Thank you to Larry and Leslie for allowing her to move West! Her daughters, Sairtia, by *B Iron-Rod Strength Singed, and Sparkalee, by *B L & S Alpines Tigress Trumpcard remain in the herd. Below: St. Claire as a 3 year-old 2nd freshener and 2 year-old first freshener. At right, St. Claire as a dry yearling, and as a 2 year-old first freshener. Lincoln has been level, long, and wide, a nice cross of these Iron-Rod French bloodlines. When his sire died in 2016, it made sense to see how he fit. His dam, Legs, appraised as a 2 year-old with an Excellent in mammary, as did his yearling half-sister, Leprechaun. He has a very similar head and style to that of his sire, Singed. We also admire the fore udder extension and elegance of his paternal granddam, Sizzle. Lincoln was sold in 2017, and we will se his first kids in 2017 as well. At right: Maternal 1/2 sister Leprechaun's milking yearling rear udder and dam Legs' rear udder at 2 years. Below: Lincoln's parents: Iron-Rod Strength Singed (9 months) and Iron-Rod SHM Show Some Leg (2 years). We looked for a French buck from a solid pedigree, capable of improving in a few specific areas, maybe from younger-aged breeding stock, and Singed is the one! Very excited to see his kids. He is a different line and look than our French does, and they should do great things together. Still smaller, as an April kid, but he is a powerhouse and so very masculine! Singed died in June, 2016, from a massive trauma to his neck. Jacquard was an exciting addition from Maine who I sold and has returned. I was very impressed with both her sire's and dam's structure, style, and performance. Her dam, Jovial, was 4th place yearling milker at the 2011 National Show, then as a 2 year-old, finished her permanent championship and also appraised 91 EEEE. 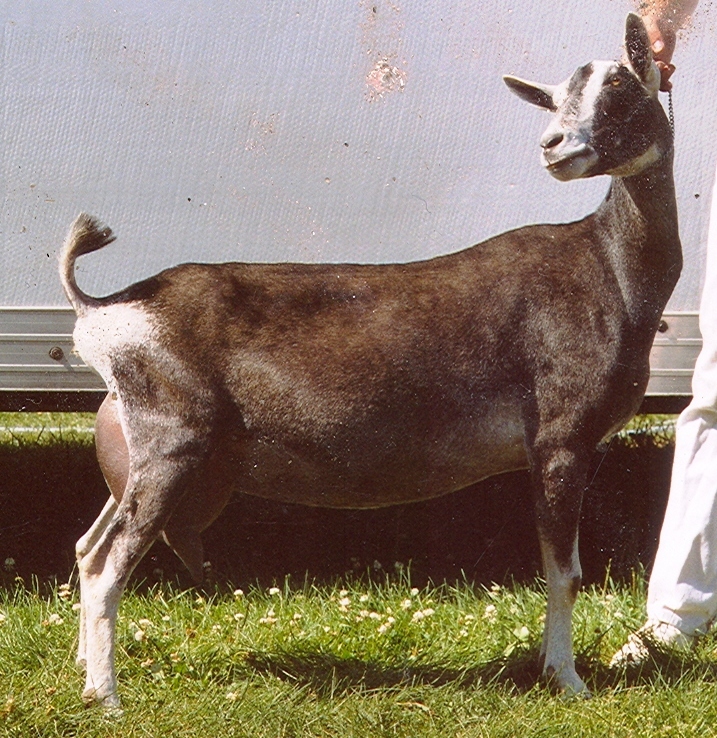 Her full sister, GCH Chateau Briant's Joyanna finished her championship at age 2, and appraised 2-02 EVEE 89. Jacquard has a lot of length and height. Thank you Phil and Bob Cassette for breeding this beautiful doe! A very tightly attached udder, with ideal medial. 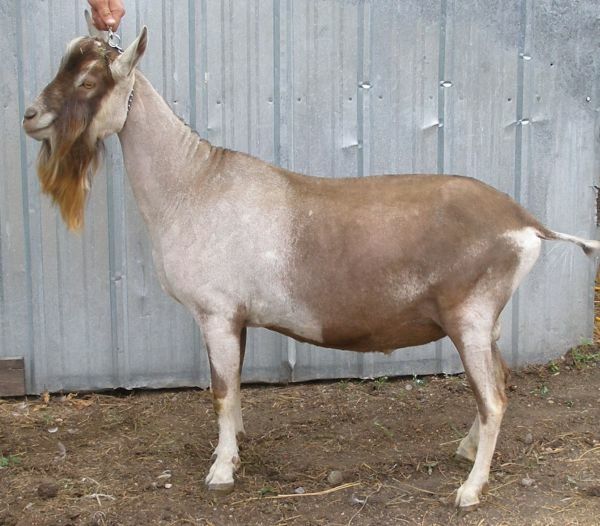 Jacquard provided us with her daughter, Dawnwind Magnificent Javotte, who remains in the herd. 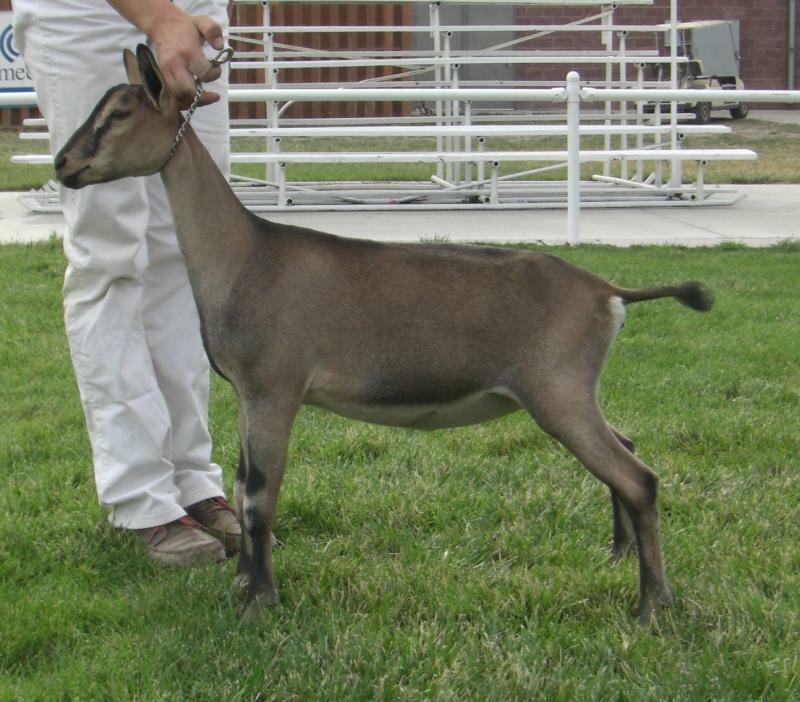 Below left: Jacquard winning her dry leg at the WY State Fair, and Right: Jacquard as a milking yearling. Above: Jacquard as a yearling, 3 months fresh. Right: Jacquard (and Maude, ahead of her) interacting with my daughter in the show ring. We weren't planning to keep this guy around, then the appraiser had some great things to say about him, and he kept growing and filling out, and he's still here. So we are excited to use him. He is well built, smooth, flashy, and really big. His full sisters were quite lovely--definitely had the strength of Cahuna with the length of Magnifico and her udder was very nice. Currently have daughters Blythe, Midori, Stimulus, Thora, Leprechaun, and Meridian. Cahuna is built like a block: wide and deep. Her beautiful, snug udder, strong feet, legs, and brisket make her a stand out. She does have large teats as a result of nursing her kids for several years. 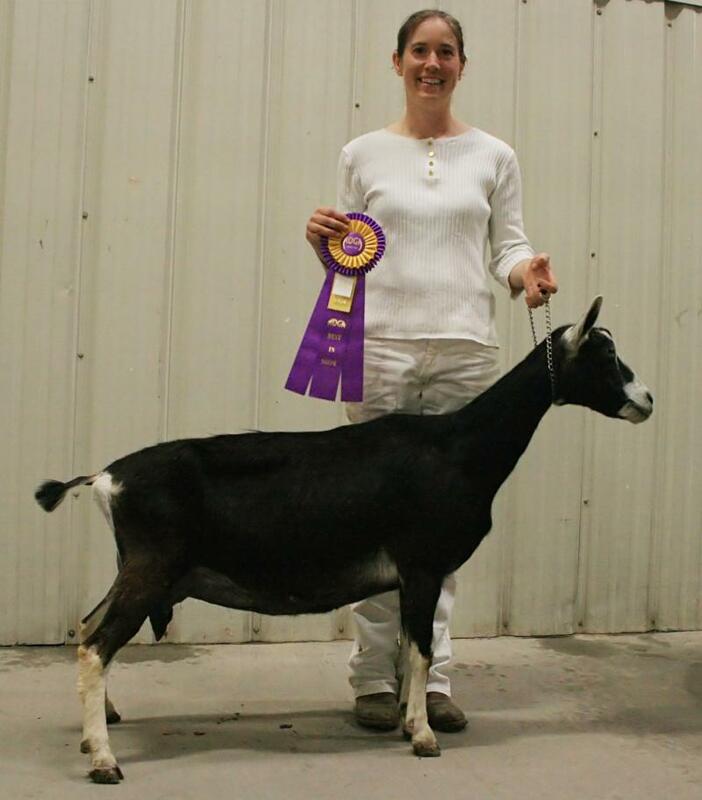 In 2009, she milked 12.8# in a one-day milking competition. We are very pleased with her permanent score of 90 VEEE at 7 years old. At 11, she continues to milk well, and has beautiful feet and legs. Cahuna died peacefully in March, 2015. Cahuna left her mark in our herd primarily through her son, SG Dawnwind Magnficiently Clever, and his daughters Leprechaun and Blythe. We already miss her, and hope to continue her legacy in our herd. 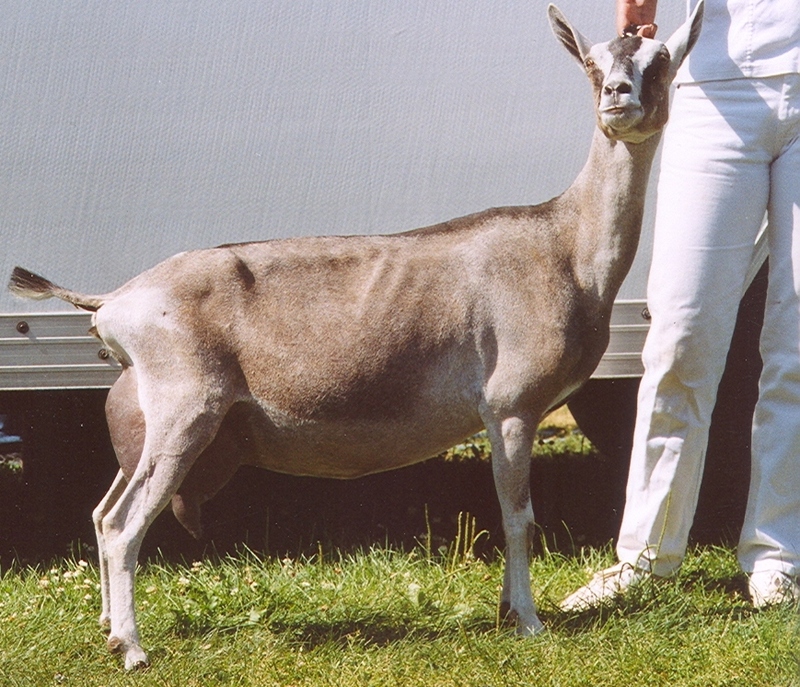 Show Results: 1xJrGCH, 5xRGCH (2004x2, 2005, 2009, 2010). [l-r] Cahuna as a yearling; at age 6; at age 11. Pictured as a 3 year-old. We are pleased to have KJ join the herd. I am impressed with his daughters, particularly those that are crosses on my Magnifico line (seen in another herd). The daughters have long, smooth foreudders, and extreme length and levelness to their rumps. His dam, Blossom, is a doe I have long admired, and I saw her when she finished her championship, and she is really something. We are pleased to have several of his kids on the ground--they are showing substance of bone and a stylish appearance. We are keeping his son out of Medesima as a junior herdsire. KJ passed away in 2015 from a brain trauma. Magnifico is a tall, level buck who excells in his rear leg set, back, and rump. He is linebred on Dawnwind Shocking Magdalena, one of our favorite does, who finished her championship at 2 years old. His daughters have freshened with tight udder attachments, lovely toplines, and his smooth front end. His daughters SGCH Medesima and Jinglebob remain in our herd. We are thrilled with his linear appraisal score of 91 EEE in 2010. [From left] Dawnwind Mega Magnifico, 4 years, rear shot; and at 3 years, front end; dam GCH Dawnwind Shocking Magdalena 2*M, 2 years. Measure has always been very tall and has now filled in her frame. Her slower growth pattern is reminiscent of Prima's development, and she becoming more beautiful with age. Her udder is well placed, with good attachments, ideal teat size and placement, and good capacity. We have retained a daughter of Measure in our herd: Marvelle (by Bon Idee). She has a permanent champion son: CH Dawnwind Measured Tatic (3-03 EEE 90). Measure was sold in 2013. [l-r] *B Dawnwind Theraputic Proximo, 2 years; GCH Dawnwind Shocking Magdalena 2*M, 2 years. We lost Minuit in 2008, just before showing and Linear Appraisal season. Fortunately, she had triplet doe kids, and we retained Medesima in our herd. Minuit was beautiful, long, and extremely dairy. Her production was always high, and she was able to complete her milking star as a yearling. Her udder was very soft, pliable, and she was the easiest doe in our herd to milk. She finished her GCH as a 3 year-old. She was a 3/4 sister to Magdalena. Her line carries on through Medesima in our current herd. Magdalena was just beautiful. 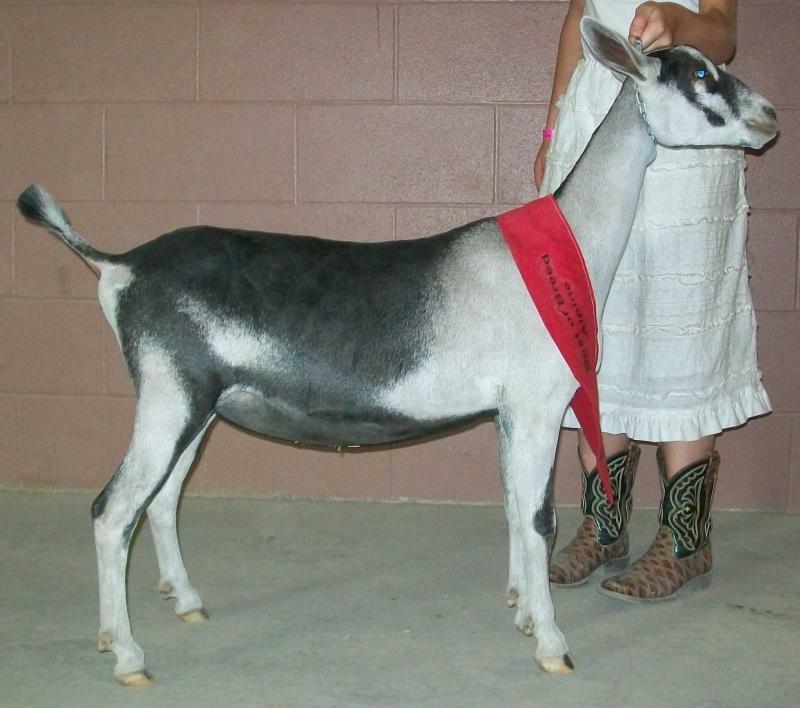 She was our first "home-grown" finished champion, which meant a lot to me. She showed strength throughout, and had a really snug udder. Her fore udder extension was really superb. She passed away in 2008, leaving us with plenty of offspring. Minuit was her 3/4 sister. At the very competitive MN State Fair, Magdalena placed 7th as a 2 year-old, and 6th as a 3 year-old. 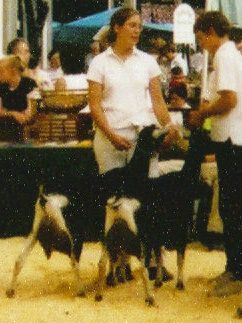 In addition to showing well at ADGA shows, she and Frances won the 2003 Senior Showmanship at the MN State 4-H Dairy Goat Show. Most of the herd traces to her via her offspring, Magnifico and Measure. 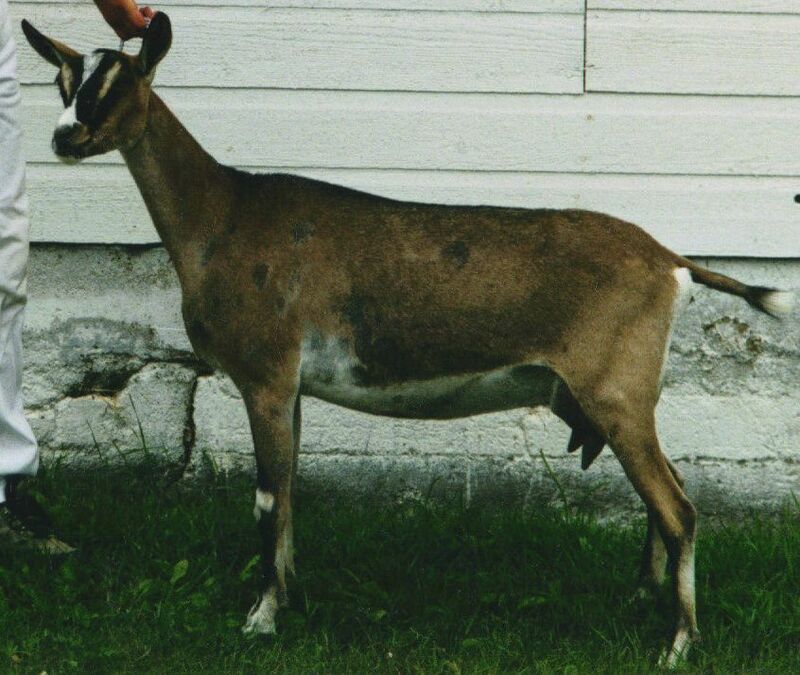 There is no doubt that Prima was my brother Arthur's doe, as she absolutely loved him. 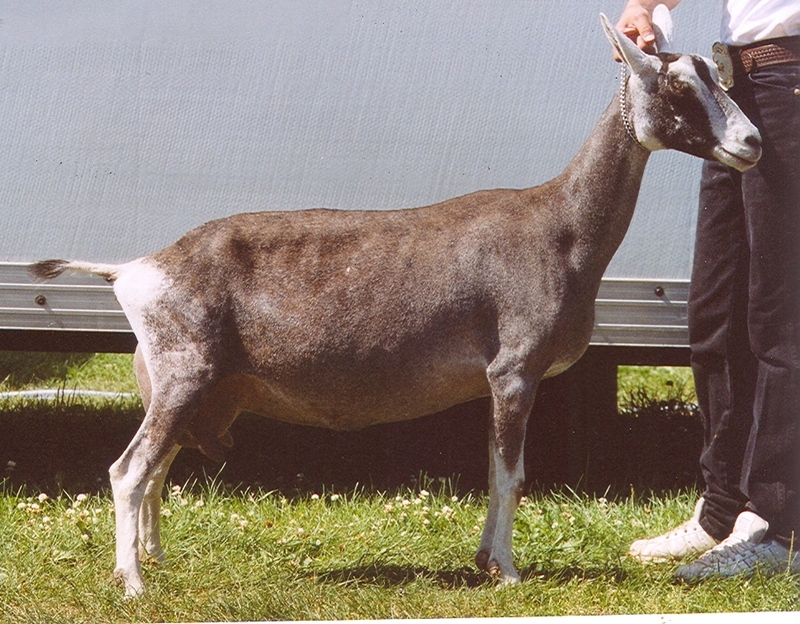 She was one of the three does we obtained from Waiilatpu in 2000, as we returned to showing Alpines. Prima was the smallest of triplets, and a bit of a late bloomer. Yet, with outstanding structural correctness, particularly in her front end assembly, she had little problem competing against the bigger girls. As a milker, she had a beautiful udder to complete the package. She had very small teat orifices. 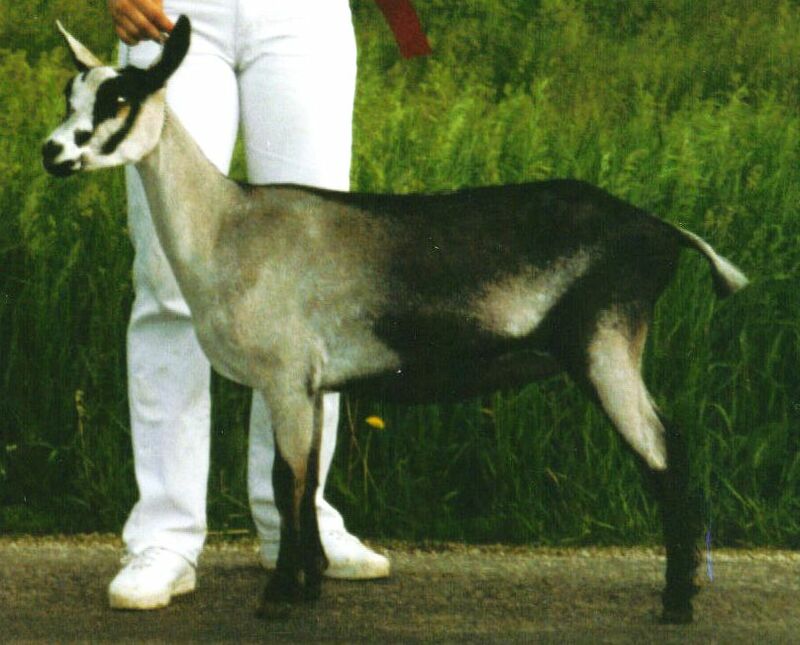 She was frequently second to Camilla in the show ring, and finished her GCH as a 4 year-old. Her influence on our current herd can be seen through Proximo, Measure, and Marvelle. Of the three doe kids we bought from Waiilatpu, Majesta was always the longest and the tallest. She also has an enormous will to milk, and at 4 years old, finally complemented udder capacity with body size. Majesta consistently threw only doe kids while we owned her, including two permanent champions (Minuit and Magdalena, above). Her dairy character and milking ability interfered with her showing abilities, as she would usually be on the thin side during the summer. She easily attained her milking star as a 2 year-old. Majesta has several RGCH wins to her name. We are happy to carry on her bloodlines through our "M" lines of bucks and does. We obtained McAnix as a kid, from Marianne Sans. 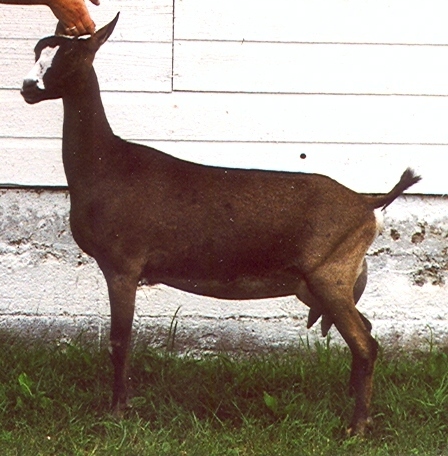 As a yearling, he was injured by another buck and dislocated his hip. He was never sound on the leg, but he was always happy and otherwise healthy. We used him heavily through the breeding season of 2001, and he passed away the following year. 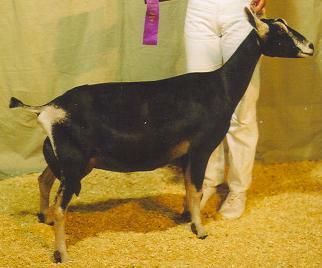 His daughter, Minuit, finished her championship, and several other daughters received their milking stars. He was never appraised or shown because of his injury.